You'll be redirected to WeTransfer, where you can download the file. Note: the file size is 62MB. If the above link is temporarily down due to heavy traffic, try this mirror link. Our 2019 Emerging Tech Trends Report is available in soft cover format. Printed on heavy weight paper with full color, the printed edition is 380 pages long (and weighs just over 5 pounds). 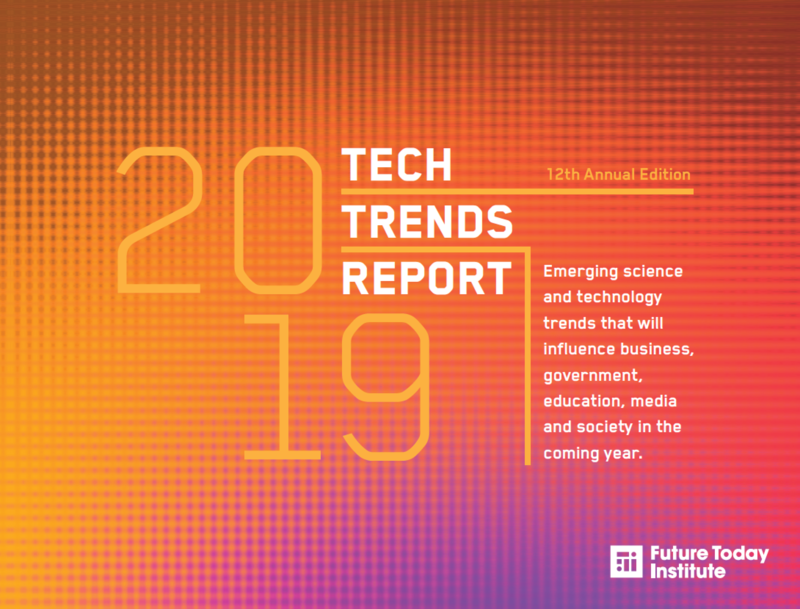 The Future Today Institute’s 2019 Tech Trends Report is in its 12th year of publication and has received more than 7.5 million cumulative views. 315 Tech and Science Trends: This is our biggest report tech trends report ever––a 30% increase over last year, when we identified 225 trends and 10 weak signals. This sharp increase has to do with the advancement of many different technologies, which is causing acceleration across many different fields. 6 Weak Signals for 2020: Including materials and biological science as well as quantum computing. 48 Scenarios: 17 are optimistic, 20 are pragmatic, and 11 are catastrophic. 9 Toolkits and Frameworks: We are including practical foresight tools and frameworks that can be implemented by your organization to advance your strategic thinking on these trends. 3 Glossaries: We’ve identified and defined key terms to help teams get up to speed quickly. They include blockchain, cybersecurity and mixed reality. 50 Cities: For the second year, we are including a list of the world’s smartest cities. We’ve ranked them using a new methodology we developed in the past year. Nordic cities dominate the top ten and make up early a quarter of the entire list. Europe (including the UK) had 13 cities, Asia 9, North America 8, Middle East 4, and South America, Australia and India each had one. No African cities made the list for 2019.